Rembrandt's Paintings Revisited - A Complete Survey. This slightly updated reprint of the concluding sixth volume of A Corpus of Rembrandt's Paintings presents a revised, chronologically ordered survey of Rembrandt's entire oeuvre of 336 paintings. A considerable number of these paintings are reattributed to Rembrandt by the author Ernst van de Wetering after they were rejected by connoisseurs in the 1960s and subsequently. 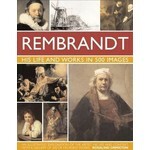 The book includes extensive commentaries on the re-attributed works and many of Rembrandt's other paintings. Provides a multi-faceted new insight into Rembrandt's world and in the fields of his connoisseurship and research. Two softcover volumes in hardcover folder: contains 430 colour plates (including 77 enlarged details) and c. 750 additional illustrations, and figures mostly in colour. 690 pages, 24 x 32 cm, weighs 4 kilos, 2017.